Feline Acupuncture – How Beneficial Is It For Cats? 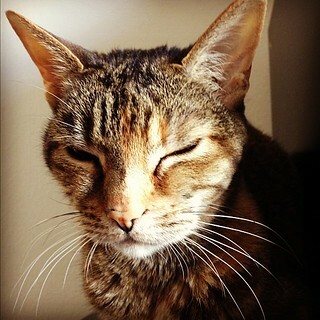 Acupuncture for cats is becoming an option for gentle pain relief and pain management in cat pets. There are many conventional pain relieving drugs available for felines, but many of them can cause severe side effects when they are used in the long term. Although there are more and more cat specific and very sophisticated allopathic drugs available, the management of chronic medical conditions is still challenging. Most cat owners in practice are first of all skeptical, as they usually cannot see that their pet would sit still and relax during treatment. Now to their surprise, feline patients are usually good to needle! Especially, if they are for the time of an acupuncture session gently restrained or sitting on the owner’s lap, they don’t really mind. Feline patients are usually very good “responders” to treatment. Their nervous system is very reactive and alert due to their nature of a predator. Stimuli set by fine needles at specific points over their body are normally quite effective and result in a good treatment response. 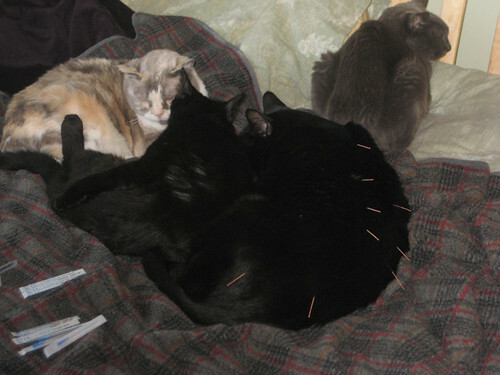 Having used acupuncture for cats in recovery after major orthopedic surgery and for cats with chronic musculoskeletal problems, it is remarkable how well these patients recovered. One of my patients was a young cat that suffered a complicated fracture of the hind leg. After successful orthopedic surgery she started to lick that leg excessively and would not bare weight on it at all, even after a few weeks not. Her vet made a decision to try acupuncture treatment before thinking of amputating the leg and the patient got referred to me. Not only that this cat would sit relaxed on a table during all treatments, but she also made a very speedy recovery and would start to use her leg after 3 -4 sessions. After 8 sessions, she could walk again very well and she stopped licking that leg finally. Her owners have been very skeptical at the beginning and were very surprised to see their cat being so patient and relaxed during our treatment sessions. With a proper diagnosis of the medical condition a cat suffers from, acupuncture can help to modulate pain, stimulate self healing processes and reactions within the feline body, stimulate the immune system and improve well-being. Arthritis in cats, a medical condition that gets still often overlooked by owners and sometimes also by vets, is worth to treat with acupuncture. Usually we would integrate this alternative therapy into your vet’s conventional treatment plan and try to achieve good pain relief. Many patients may not even need conventional pain relief drugs any more or only sporadically. Cats function differently and they are not “small dogs”. Unfortunately, they were considered as such for a long time, but as veterinary medicine gets more sophisticated a whole new world of feline physiology and pharmacology opens in front of us. How severely will the function of inner organs be affected? Giving medication orally to cats can be challenging…. Therefore, gentle alternatives, such as cat acupuncture or cat acupressure may become an important pillar of the management of long term conditions. Previous Previous post: Canine Acupuncture – How Can It Help Your Dog?